All gussied up: The southwest corner of Ellsworth Street and Second Avenue in Albany. On a stroll in downtown Albany the other evening, the buildings on this corner caught my eye. They show off the efforts of downtown owners to upgrade their buildings with the help of urban renewal. It’s not the only place downtown where this is the case. But it’s among the latest to be completed. The two buildings on the left, 202 and 206, just had their exteriors refurbished. In March, the Central Albany Revitalization Area granted owner Seth Fortier two storefront restoration grants of $10,000 each. Putting up new awnings and repainting 202 was estimated to cost $21,000. For 206, the estimated price tag was $110,000. A coffee shop has opened there since. In December 2017, the CARA board approved a $50,000 loan to help baker Jolene Wilson launch her Natural Sprinkles Co. Bakery in the corner storefront at 202, the former Tripp real estate office. The third building from the corner, of course, is the famous Novak’s Hungarian Restaurant. 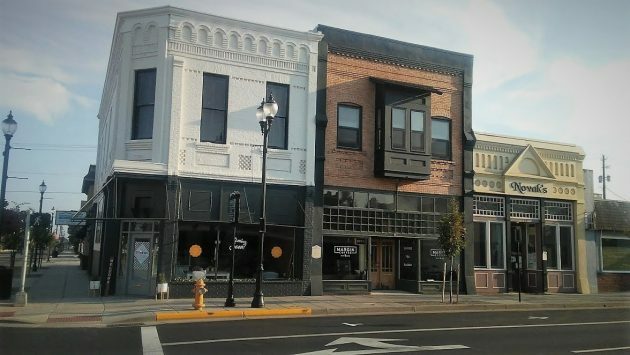 In April 2014, CARA approved $200,000 in aid toward the reconstruction of the storefront and much of the building, a project then expected to cost some $800,000. The aid was in the form of a “loan” that would be forgiven in five years, presumably in the spring of 2019. To top off this scene, the lamp posts you see are three of the many installed as part of CARA’s roughly $9 million downtown streetscape project, completed this summer after two years or work. I’ve always liked to go for long drives to small towns around Oregon, sometimes spending the night. I’ve always been drawn to downtown’s in small cities, generally 50,000 or less. I’m not sure why. I guess I just like to stroll past bakeries, antique stores, restaurants, and other assorted shops, stopping in to check them out. I especially like Roseburg. Even the real small towns of Brownsville, Silverton, Sutherlin, and others are a joy. I know the controversy that surrounds CARA. To me it seems to be more a “damn if you do, damn if you don’t” scenario. On the one hand, a vibrant downtown can be a big draw for a city and its economy. If you want to see sad, stroll the streets of a ghost-like town where decaying store fronts and for sale and rent signs are all you see. But on the other hand, not only are taxes a sticking point, but all too often those charged with it are too much a kid in a candy store. Take Albany’s downtown improvement. I, for one, like the new street lights. They’re aesthetically pleasing and put off light where you can actually see. Maybe crime and vandalism will go down as a result. But then you have the overhanging lights on Second and Third. And I just shake my head over whoever it was that came up with this idea. Not only the cost, but they look stupid and take away from the surrounding streetscape. I don’t care if it is time-period related. They’re an eyesore and are ugly. Again, a kid in a candy store. Especially when it’s dad’s money.